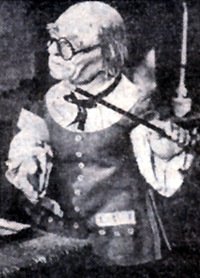 There were two production of B&W “Rubovian Legends” marionette puppet plays. The first production, made in 1955, consisted of just three plays, and was transmitted live from the studio. Apart from one still photograph (printed in The Puppet Master, June 1956), no recording exists of any of these. The second production, which began in 1956 and lasted through 1965, is the one remembered by most people familiar with “Rubovian Legends”. It consisted of twenty-six plays, two of which were remakes from the first series. 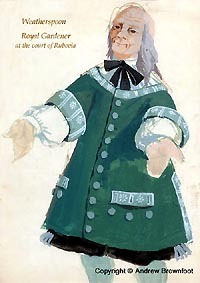 The first production of three plays used tiny (1/5 life-size) marionettes and scenery. The marionettes were made by Kim Allen, borrowed by Gordon from the BBC’s puppetry department. Settings and costumes for the first two of these plays were designed by Gordon Roland (The Queen’s Dragon) and Donald Horne (Clocks and Blocks). No settings and costumes designer credit was given for the third play (The Dragon’s Hiccups), however, we do know that Rubovia designer Andrew Brownfoot was involved with it, providing some new settings and a new costume for the Queen. 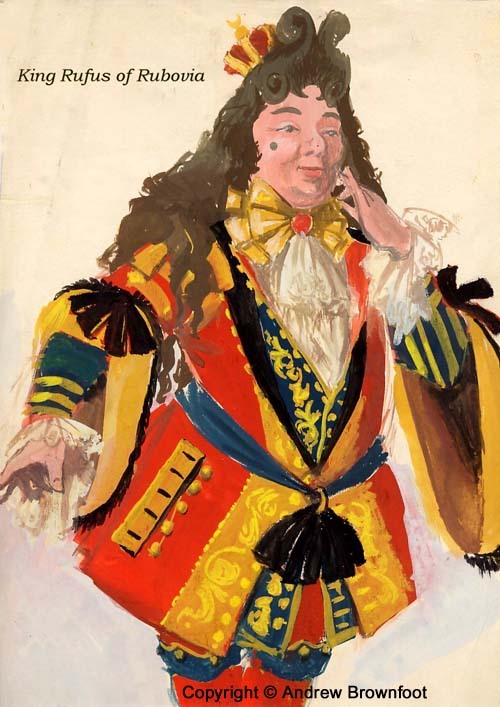 The second production of twenty-six plays used larger (1/3 life-size) puppets made by Gordon Murray for which Andrew Brownfoot designed and made all the costumes and scenery, with the assistance of his wife Margaret. Both Andrew and Margaret were initially still studying Theatre Design at The Central School of Arts and Craft in Holborn, but with encouragement from Jeanetta Cochranne, the Head of Theatre Design, spent most of their time working for Gordon and the BBC. In the early days of “Rubovian Legends” production, there were many challenges to be overcome. For instance, there existed within the culture of the BBC, an expectation that Gordon would use existing resources for scenery, puppets, and costumes, etc. After starting with these, Gordon quickly developed a very clear vision of what he wanted to achieve, a vision that could not be confined within the limits of what had already been done by others. His artistic vision required a more advanced marionette puppetry format, with larger, flexible-faced, moving-mouth puppets, professional voice-actors, and larger scenery to match. He also needed to have artistic freedom. In the end this was recognised by the BBC, and Gordon was left to his own devices, which he loved. However this recognition did not come with a budget to match, and so when Gordon needed a sewing machine, money was tight and he was not able to requisition one. As a result, unconventional solutions were the order of the day. Gordon said in a 1959 interview (Puppets in a Hot Tin Shed, by Roger Watkins, The Stage and Television Today, May 7, 1959, p.12), “I’ve broken every rule the BBC has ever made. Most of the things I do are highly illegal—like buying a sewing machine on the petty cash, for instance. You just mustn’t run up huge bills on the petty cash like I do.” If the BBC was turning a blind eye to any of Gordon’s activities, it was probably because his puppet plays were selling well overseas, and were doing well in the UK as well. After the much needed sewing machine was obtained, it was quickly put to good use by Andrew Brownfoot, to make the intricate (1/3 life-size) miniature costumes for all of the puppets. And when the petty cash would not extend to some need, Gordon often bought it out of his own pocket. Such was his level of dedication and desire to make the puppet productions the best that they could be. Looking around the Tin Shed workshop area, the viewer would notice all sorts of materials which were needed on hand to create the world of Rubovia. Liquid rubber for heads, plastics, moulds, paints, wood, glue, wire, the celebrated sewing machine, fabric, and props galore. An exquisite four-foot-long model of Rubovia castle and its backdrop of snowy mountains could easily catch your eye there, along with fancy fireplaces, four-poster beds, all to Andrew Brownfoot’s designs in expanded polystyrene, a kind of plastic so airy and light, “that a puppet’s cough would blow it up the chimney.” (Come to the Puppet Theatre! by Earnest Thomson, Supplement to Radio Times, December 4th, 1959). In fact you’d have seen pretty much anything one would expect to see gracing the interior of a castle, such as miniature paintings, wall hangings, drapes, tiled floors, Louis XIV style chairs and tables. Then there were props for the outdoor scenes as well, including anything related to Queen Caroline’s famous cabbage patch. Rubovia was very much a team effort. It would go like this: Gordon gets an idea of what he wants to do and tells Andrew who starts making rough designs of the costumes and scenery. When they have agreed on how it should look, Gordon starts work on making the puppets, Andrew builds the scenery and makes the puppet costumes. When the puppets are completed, Andrew paints their faces and Andrew’s wife Margaret assists with making finishing touches such as make-up and styling the hair. The after the puppets are dressed and Gordon has completed the script, rehearsals start with the puppeteers. There was a large area available in the Tin Shed for this, which allowed for three puppet stages to be set up at the one time. 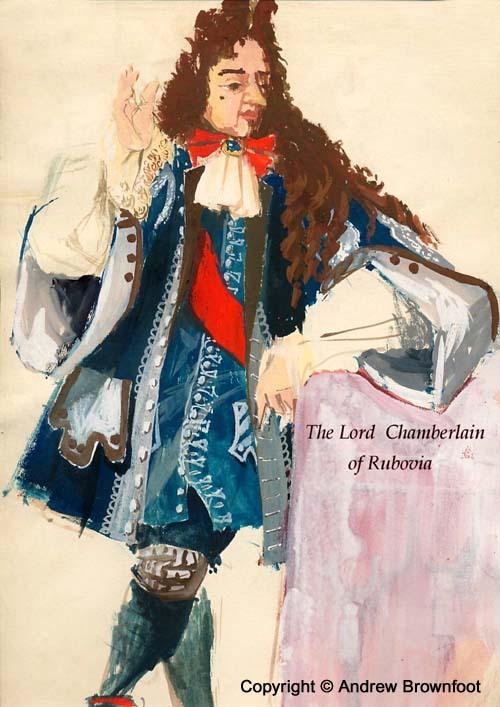 The first few “Rubovian Legends” plays were sent out live, in front of the television camera. On the day of transmission, everything had to be taken down and then re-erected in the television studio, in time for one or two last camera rehearsals before the play went on air at 5:00 pm. Live transmission was a very demanding and tense situation for all those involved. The puppets themselves were rather heavy, and the movements required of them took considerable skill and strength. Now and then the unexpected occurred, such as a puppet falling over, or strings becoming tangled. The technology of tele-recording had not been developed yet, and nor was filming the norm, so there was no possibility of editing out mistakes, and once the transmission was over, six weeks of hard work were down the tubes, figuratively speaking. By 6:00 pm the scenery was being torn down to make way for another transmission, and everyone involved in the production would rush over to the BBC club to wind down and recover from an extreme sense of anticlimax. Gordon said recently of Andrew Brownfoot (July 2003) that he admired Andrew’s talent a lot, and was very surprised and sometimes amazed at the wonderful costumes and sets that Andrew had come up with at such a young age. Gordon added that he had not expected a boy of seventeen to be so talented and capable, doing things so well, even doing all his own research for the costumes and sets. Andrew Brownfoot's costume for Sir Albert Weatherspoon is comprised of a short-sleeved greenish-brown tunic over a full-sleeved white "poet's shirt" and dark brown tights. The shirt has a gathered neck with stand-up collar and cravat tie. 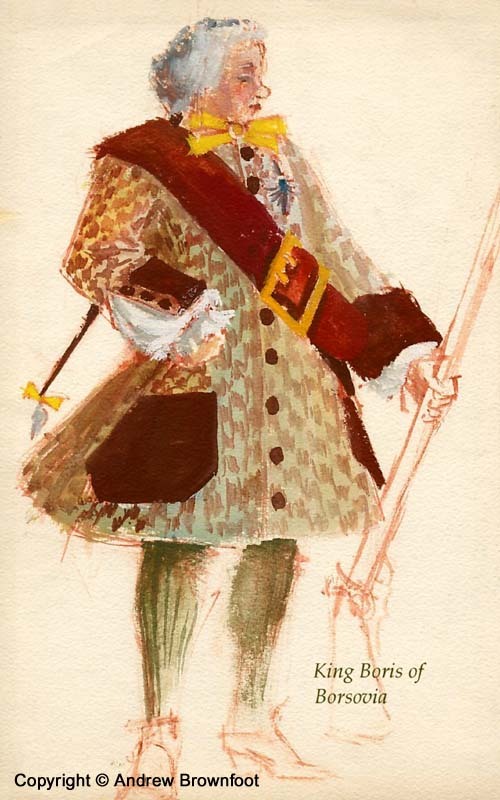 The short-sleeved tunic has a decorative border around the top edge and the bottom ends of the sleeves, having a plain gold sheen, being somewhat less ornate than in the original design painting. The tunic sleeves are somewhat shorter than in the design. Note, however, that the decorative borders along the top edge of the tunic's two front pockets are retained exactly as shown in the original design. The buttons are a metallic brass or gold colour, rather than the light green mother-of pearl or bone (?) of the original design. used in the opening sequence of “Rubovian Legends” episodes. bridge to the castle's from entrance will attach. Photograph courtesy of A. & M. Brownfoot. *Castles and Mansions [Bohemia and Moravia] by Zdenĕk Wirth, Jarslav Benda. Artia, Prague 1955. 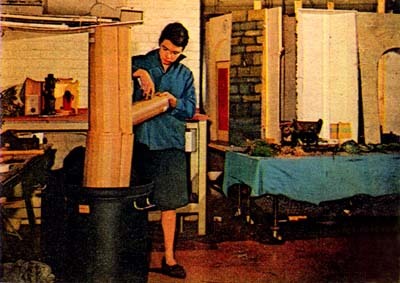 Hazel Martingell, assistant to designer Andrew Brownfoot, making a tree out of corrugated cardboard. Afterwards it will be covered with plaster and then painted. 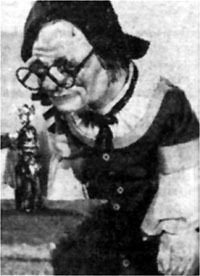 This picture appeared in the article, The Tiny World of Puppets, Look and Learn magazine #38, 6th October 1962. Photograph by Rosemary Mathews. Look and Learn was published by Fleetway Publications Ltd.